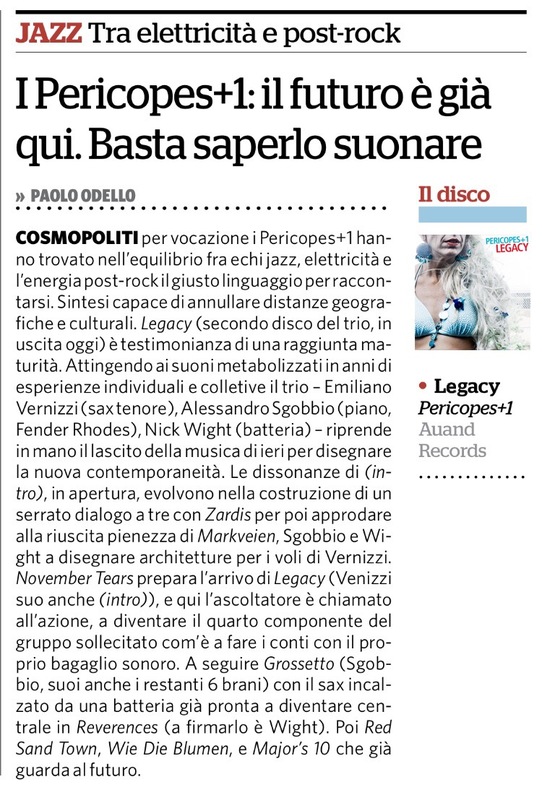 Legacy is Pericopes+1’s newest album and finds the trio embracing a new musical palette inspired by alternative and popular culture of the past several decades: dynamic grooves, rhythmic focus, Rhodes and electronic effects enhance clever compositional devices without distorting their acoustic sensibilities. As the title suggests, Legacy is intended to pay respect to the iconoclastic artists who bravely followed their creative vision in light of extreme uncertainty. The concept for Legacy began to emerge naturally at rehearsals and soundchecks during tours for their release of These Human Beings in 2015. With old school charm, they ‘road tested’ new repertoire on the bandstand throughout 2016 before arriving at Artesuono studios to record. The timing coincidentally parallels the deaths of popular artists who not only influenced Emi, Alex and Nick’s musical interests, but past and future generations too: David Bowie, Prince and Chuck Berry (to name a few) set trends and pioneered musical genres that challenged the labels that were often imposed by mainstream media. Pericopes+1 capture a variety of moods, styles and aesthetic qualities that allow the listener’s imagination to connect the pieces.